This time, I did not acquire a business because I got annoyed at bad service and decided to buy a similar business to give them a hiding of note. I do enjoy the hospitality business and views of the mountains and countryside. Don’t be surprised if I tell you I have looked for over 10 years. I travelled even as far as Messina (near the Zimbabwe border) in search of the perfect spot. When I was introduced to the wine farm Alluvia, I knew this was the one. Position, position, position. It is next door to Tokara and opposite the most exclusive wine estate Delaire. The owner spent over 300 million Rand upgrading the wine farm. Trust me when I say I am the pauper in the valley on Helshoogte in Stellenbosch. In any event, all the rich and famous actors from overseas stay at Delaire and their helicopter pilots and chauffeurs stay at Alluvia. Of course, we have a mix of clientele who also book with us. We offer 2 and 3-bedroom accommodation as well as many single dwellings. 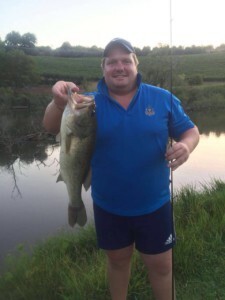 Clients have an opportunity to mountain bike, catch 3kg bass in our dam, enjoy the springbok and farm animals. I specifically didn’t want a wine farm with bulk wine but more of a boutique winery, with our signature wine being the Cab Franc, but we also produce Cab Sauvignon, Sauvignon Blanc and a Dessert Wine. 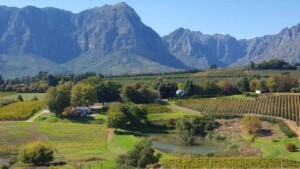 The Banghoek Valley which we reside in is renowned for its world-class wines. I have recently decided to simplify everything as the farm has been taking up too much of my head space, so I am now taking on long term tenants, which is proving to be very successful. So if you are in the area for some wine tasting, pop in, you won’t be disappointed. Just make sure you have a sober chauffeur on standby as when your tasting starts it will be hard to stop.